The period covered by Arts:Search is 1884-1892. Available soon. Quarterly. The official journal of the Century Guild of Artists. Founded by the architect and designer Arthur Heygate Mackmurdo (1851-1942), the Guild was one of the earliest Arts and Crafts groups in Britain. The magazine contained essays on art, literature, and occasionally architecture and music. The principle contributors included Mackmurdo, Selwyn Image (the author of numerous articles), Arthur Galton, May Morris, Herbert P. Horne, Christina Rossetti, and Hubert Parry. 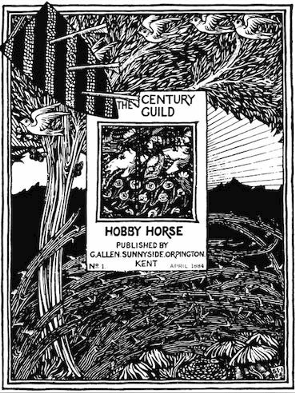 The Hobby Horse was much admired by William Morris. By fusing art and literature in a magazine whose layout and design was a conscious aesthetic statement, it was precursor of pioneering Modernist magazines such as The Savoy, The Yellow Book and The Dome.